I’m often amazed that when I calculate the time involved in shopping, preparing and cooking Thanksgiving dinner – that the actual consumption of said dinner takes comparatively minutes! Gang – those moments of speaking with our homeowner – Miss Phyllis – were the best part of my day. I can’t even begin to express how her outlook on life, her brilliant smile, her positive attitude changed EVERYTHING about my DAY OF ACTION. Miss Phyllis “schooled me” good. NOTHING in the past year of my life compared to the hardships that this woman faces daily. Yet her peaceful contentment and her faith that someday she would be in heaven with “no more suffering and no more pain” made me change my entire outlook on my relatively insignificant (compared to hers), inconvenient, set-backs. After every serving event I always say that I have been privileged to GET way more than I ever GIVE. And the Day of Action was certainly no different. Like you – I GAVE my time, my money and my feeble little bit of muscle. But – I GOT an eye opening, soul searching, heart bleeding experience I won’t soon forget. I hobbled away from York City that day, tired and sweaty….my shirt was soaked with dish sanitizer….my car was loaded with equipment to drag back to actionchurch….but my heart was full and my soul content – my brain already planning the next DAY OF ACTION. Thanks to all of you who participated by gathering and donating items. Grateful to all of you who showed up ready to serve wherever you were needed. Thanks to Tina and Rachel for an outstanding job organizing breakfast and dinner. Thanks to the wee folk for the freeze pops and cards. I love and depend on the teens pitching in to serve others – thank you. We appreciate all the behind the scenes work on the part of Servants to make the week happen. But – most importantly, praise and thanksgiving to God who in his mighty wisdom had it all planned in advance. Breakfast crew – please plan to arrive at Logos Academy by 6:00 a.m. We will need you to prep and serve breakfast, as well as clean up the kitchen after we are finished. Work crew – Please plan to arrive at Logos Academy by 7:00 a.m. – You will be served breakfast, get your job assignments and pack your own lunches prior to leaving for the day. Dinner crew – please plan to arrive at Logos Academy by 4:00 p.m. We will need you to set up food stations, serve dinner and clean up the kitchen after we are finished. We may need a few of you to deliver meals to homebound homeowners if possible. Everyone working with food will need to wear either a hat or a hair net. Gloves will be required while prepping and serving food. Also, please wear closed toe shoes. Work crew should dress is suitable shoes and work clothes. Please bring goggles and work gloves if you have them. You may want to bring your own small cooler for your lunch if you have one – if not – job site coolers are provided. Please bring a water bottle that you can fill up on the job site. Looking forward to a great day of loving and serving others! The folks at Servants have been hard at it – out in the community – blazing the way during their first ever WEEK OF ACTION in York City. 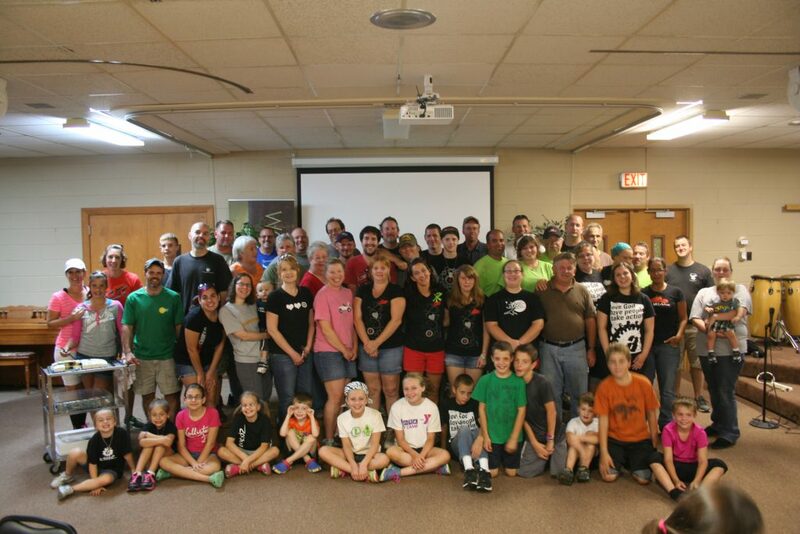 Tomorrow – the crew from actionchurch will join them as we lend our hearts and hands to help our neighbors in need. All week long the emphasis on LOVE itself being the action as we move to our DAY OF ACTION kept running through my head and I wanted to take a few minutes just to give you an overview of what that might actually look like as we rise – and hopefully – shine, early tomorrow morning. I am certain there will be organizational snafus…..names that aren’t on lists and tools that might be forgotten. I am VERY certain that my family will not relish the fact that they will have to rise at O’dark-thirty to lug supplies. I know that there will be mix-ups and forgotten information – but let us all try to be patient and kind to each other as we work through this first ever event. Some of us may have “cushy” jobs that others might envy. Some of us might be proud and want to boast of our accomplishments throughout the day. Or, we may feel that a job is beneath our skills – but let’s all try to work together – HUMBLY – as we serve others. Let’s pitch in wherever there is a need and go out of our way to encourage others throughout the day. It goes without saying that things will go wrong. It goes without saying that when those things do go wrong it is easy to get angry. It would be a normal human reaction to point the finger and the blame. – Strive to be flexible and helpful. If something doesn’t go your way – “Shake It Off”. Give God the glory for everything that DOES go right. I was looking for a picture earlier this week and going through old blogs when I ran across the quote below. It was from some information that I gave to the crew as we headed out to serve the victims of Hurricane Sandy. I was so green, wet behind the ears, had never lead a mission trip….didn’t have a clue what we were heading in to – kind of like tomorrow. I have no idea what the DAY OF ACTION will hold – but I DO know that these words are just as important to the ” actionchurch brand ” as they were in 2012. Crew – as we head off to our DAY OF ACTION – Let’s just be actionchurch. Let’s be ON-BRAND in such a way that everyone we encounter knows who we are and that we serve a God who is love. I heard the same message twice yesterday….and it bears repeating – as disciples we are called to show God’s love through out actions. We love God first – and then our actions reflect that love. It is not the actual action that is somehow earning us gold stars in the “How to Get to Heaven” column on a checklist; but the love behind those actions – that is what God wants us to show the world. Annnnnd – actionchurch did that in a big, big way yesterday. I had the privilege of seeing the love on your faces as you brought your offerings to the table in the form of donations for our WEEK OF ACTION. I could feel the love that went into your choices of pretty and practical gifts. I got to hear the stories of how you decided, lovingly – what to give to others. It was a true reflection of Christ’s love and I can’t wait to see that love spread over the homeowners that we are going to serve in the coming week. One of the best stories actually gave me goose-bumps. I arrived at church (early for me – but late for all the amazing actioncrew) to find a donation table already overflowing with wonderful gifts. And amongst that pile there were several adorable hand-made cards for our homeowners. It turns out that one of our actionkids has a big heart and a creative streak. Beautiful in their simplicity – they had perfectly penned little inspirational notes inside….”Sending warm thoughts of love, hope and peace your way” and “You are special, hang in there”. Out of the mouths of babes -and so perfectly On Brand for actionchurch – that I just had to share them with you. I can’t begin to explain how those messages of love touched my heart -just as I am certain they will touch the lives of those we are reaching out to this week. You see – love IS the action. It isn’t necessarily about picking up a hammer or donating a case of Gatorade. It isn’t about the type or quantity of the gift. It isn’t about the value of the gift….It’s about the love BEHIND the gift. I am loving how all of you have shown your love for Home Helps. Remember to keep showing your love in action every day – but especially this week as we reach out to help our neighbors in need – let our actions reflect Christ’s love. If you’ve been living off the grid or have been in a coma for the past month – maybe you haven’t heard that actionchurch is gearing up for a huge service project in conjunction with our friends Servants, Inc. Unfortunately, the deadline for playing with power tools….and/or losing an appendage (if you are on Don’s crew) has passed. Home Helps has a plan for how many homeowners we can serve during the WEEK OF ACTION and how best to address those specific needs. So, if you haven’t signed up for work crew detail by now you don’t get to wear a tool belt – well – I guess you can, but that’s just weird. BUT – that does not mean that you can’t be part of the team. One of the things I love about service opportunities of this magnitude is that there are always inventive and creative ways that you can help! I want every single one of you to be a part, in some way, of this first ever event in the life of our church. Together, with your help, we can make this happen! Work doesn’t just occur at the homeowner’s house….Servants and Logos Academy (our host facility) have plenty of opportunities for people willing to serve. Servants has a huge warehouse in Red Lion that could probably use a good sweeping/stocking/reorganizing when the event is over. And I’m sure that any time during the week Logos Academy would be more than grateful for someone willing to mop floors or scrub countertops and tables. Cooking, crafting, baking and babies! – all the meals for all the volunteers throughout the week happen because people offer to donate food! I’ll bet you have a special recipe that is the star of any get together. Are you good at making cards (thank you, you are loved, etc) or decorating lunch bags with inspirational messages. Do you like to take pictures? Could you make the homeowner a scrapbook of the event…..or a video montage of the volunteers? Even better – we need several volunteers who might be willing to have a “play date” with a couple of actionkids during the day at our facility. Childcare is a big part of these kinds of events. Ever heard of “being the gopher”? It’s a real thing – not just a job site joke. Sometimes the most important job is standing around waiting to …..”go for” – the tool from the toolbox. Or…..”go for” – the tape measure in the truck. Like to drive? Can you offer to be the person making the Sam’s Club run, or the person who zooms back to the warehouse for some forgotten tool? Some of you are really, really good at interacting with people. Can you be the person that simply sits with the homeowner and listens to their stories? Can you be the person that transports the homeowner to the Friday evening meal? Can you be the person that keeps in touch with the homeowner, making sure they don’t have any further needs…..and inviting them to church? And just as important as all of the above…..we STILL need donations! Practical items, pretty items, gift cards, etc. AND prayers. Don’t forget the prayers! With even a little bit of faith – together – we can move mountains…..or re-route plumbing!